Businesses today are looking to marry profit with purpose. Until recently, most people considered these programs to be accessible and only made available to employees at the largest, most responsible employers (e.g: Patagonia, Salesforce) that have a team of people/resources dedicated to employee experience and impact programs. Porpoise helps small to medium-sized companies implement these same engagement programs that the top brands are offering their people to deliver meaning, purpose, and impact while tracking key metrics, and stories to their stakeholders in order to provide an ROI on Social Impact. It’s our goal to help companies realize a more impactful business model where they can align social impact with their business, specifically through their people. One of the many ways companies are able to engage their people while maximizing social impact is through events. Just like other initiatives that companies run to engage their people, events have a lot of moving pieces, making them a challenge to manage. The Porpoise platform saves managers on average over 6 weeks of time per year by automating engagement and reporting initiatives associated with their employee engagement and community involvement programs. 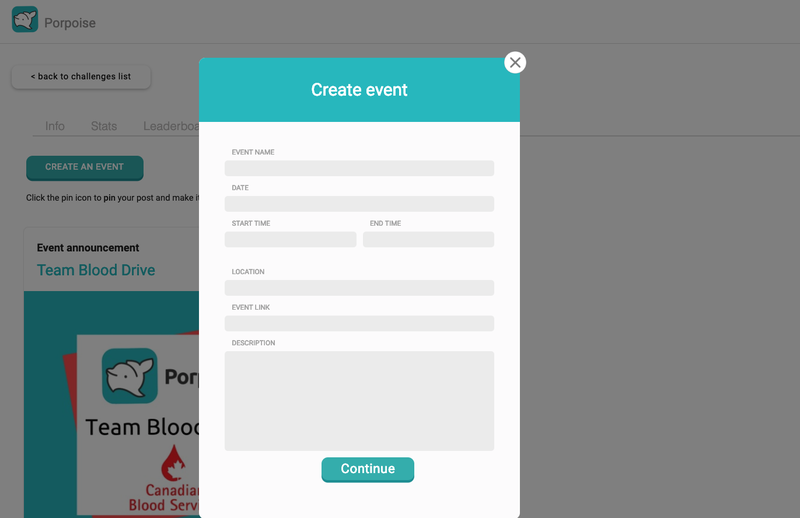 We’re hoping to make this time savings even more impressive with our latest feature, Events! 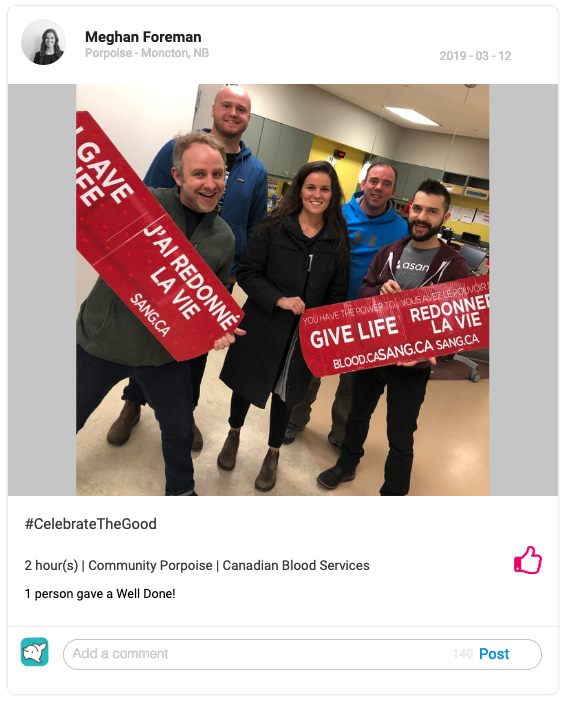 To provide you with an example, the Porpoise team hosted a team blood donation event under our community involvement challenge just last week! The first step in creating an event is to organize your event details and logistics. This is where you’ll add the name of your event, the date and time, location, and a brief description of what is going to take place. Next, it’s time to invite your people! You can include a custom invitation message. 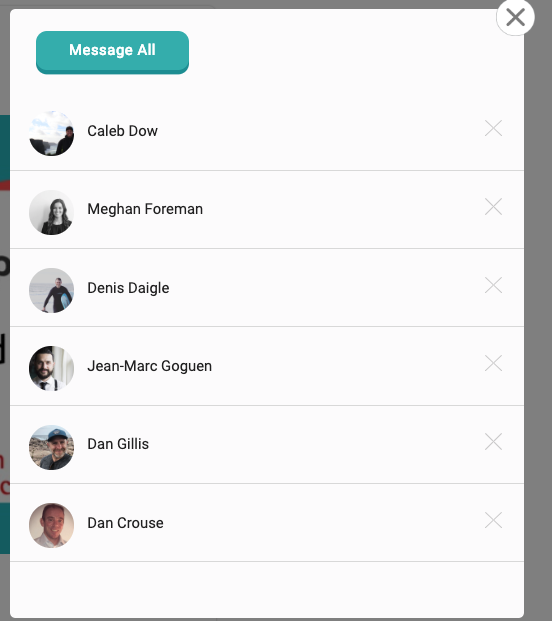 Once you invite your users, they will all receive a notification that prompts them to opt in. As they respond to your invitation, you’ll be able to see who has registered for your event. You’ll also be able to send them messages before and after the event. This is great for providing additional details and reminders above and beyond those that are automated. Once the event has passed, all attendees will receive a notification or email encouraging them to create a post. This is how you can capture the impact, stories, and photos from your event like the one below! You can watch a video of the events feature in action here! If you want to start engaging your people, capturing stories, and celebrating your impact with your stakeholders, book your Porpoise demo today!